MEATLESS WONDER Hunter Bryson packages the first batch of Shroom Jerky. When Wyatt Bryson moved back home to his family's 15-acre property in Occidental to make a go as a farmer, friends said he'd have a tough time earning a living. He'd been growing edible mushrooms in Hawaii and hoped to apply his knowledge here, selling oyster mushroom kits and teaching classes so customers could grow their own. The fungus-farm idea is still alive, but Bryson has dropped his shovel and turned his energies to another fungal enterprise: mushroom jerky. He and his brother, Hunter, came up with the idea. Hunter's wife is from Thailand, and that's where Hunter was exposed to mushrooms as a street snack. "My brother is a chef," Bryson says, "and he whipped together a recipe we just got an amazing response from, and we were like 'Man, I think we're on to something,' and we changed gears. 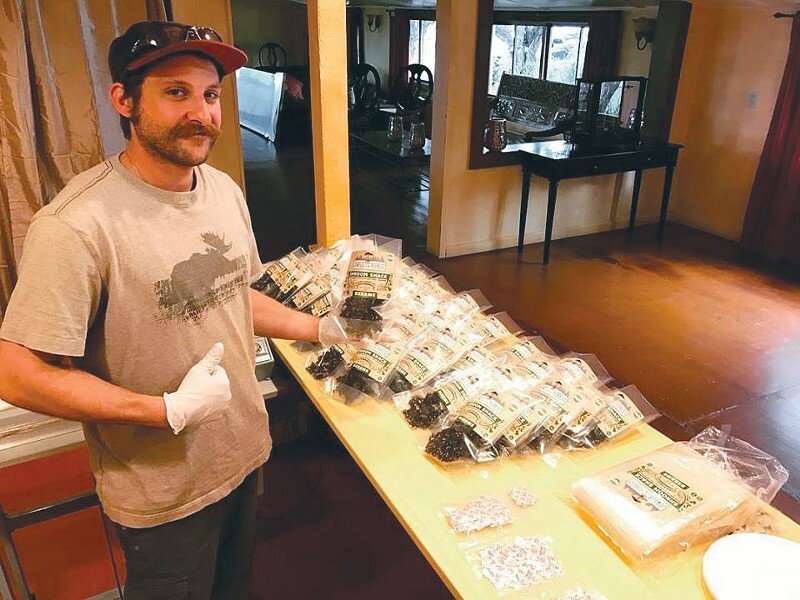 We're not growing mushrooms at the moment but focused on building the jerky business." The brothers joined with business partner Darren Racusen. They've only been operational for about month, but interest is growing. The product, Shroom Jerky, is sold at Occidental's Bohemian Market, Scotty's Market in San Rafael, Mill Valley Market and online at shroomjerky.com. Bryson says they are in talks with Community Market and Oliver's Market to carry the product. A 2.5-ounce package sells for $7.99. The inherently sweet, nutty flavor of the oyster mushrooms plays off the marinade well. If you didn't know the jerky was made with mushrooms, you might mistake it for meat. The flavor and texture are meaty, not surprising since oyster mushrooms are high in protein. Current flavors include sesame and sweet chile. Thai curry and Louisiana barbecue flavors are in the works. "I like to take it into bars sometimes and fool people," says Hunter. "They say, 'I love it. Is it beef or pork?'" If you were stuck in the car on a long road trip with a bunch of vegans and this was all they brought to snack on you would not be bummed. Heck, I'd pick up a bag myself after the trip was over. While there are high-quality brands of beef jerky on the market, much of it comes from meat of dubious quality, and Shroom Jerky makes for a more healthful snack, whether you're a meat eater or not. The strength of Shroom Jerky is its simplicity: dried organic oyster mushrooms and a handful of seasonings. The process is pretty simple, too. Dried mushrooms are rehydrated in a sauce and then dried again at the company's commercial kitchen in Sebastopol. When done, the mushrooms still retain moisture and are pleasantly chewy. "They've got a great flavor," says Bryson, "and aren't as mushroomy as others like shiitakes." While the brothers plan to start growing mushrooms again at the family ranch, it won't be enough to meet their needs. Ten pounds of fresh mushrooms dries down to one pound, and since they make jerky in 50-pound batches, they'd need 500 pound of fresh mushrooms for each run. That's a lot of fungus, even for passionate mushroom men like the Brysons.